Programmed Settings are Never Lost! 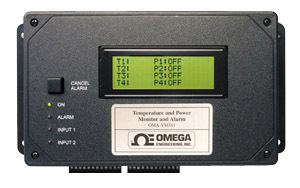 The OMA-VM540 monitors the temperature of up to four areas and up to four 12 Vdc powered inputs. The OMA-VM541 monitors the temperature of up to four areas and up to four 24 Vac powered inputs. The OMA-VM540 and OMA-VM541 will call and alert you with a voice message or a pager alert when a temperature is out of limits and your valuable equipment is in danger of being damaged. The OMA-VM540 and OMA-VM541 will call you if power is lost at any input or the auxiliary alarm input becomes active. The OMA-VM540 and OMA-VM541 can be called at any time to check the status of any input. When a temperature input is out of programmed limits, a power input changes from its normal state, the power at the wall-mount power adapter is out, or a contact closure occurs on the auxiliary dry contact input the OMA-VM540 and OMA-VM541 will dial all programmed phone numbers until contact is made. If contact has not been made after dialing all phone numbers, the OMA-VM540 and OMA-VM541 will wait twenty minutes and then begin calling again. This sequence is repeated until contact is made. When the OMA-VM540 and OMA-VM541 is calling a standard voice number, it will play the recorded alarm message and the current alarm condition. The OMA-VM540 and OMA-VM541 will then prompt the user to enter the PIN. When the correct PIN is entered, contact has been made. The OMA-VM540 and OMA-VM541 will stop calling until a new alarm condition occurs. When the OMA-VM540 and OMA-VM541 calls a pager number, it will transmit the programmable Local ID Number for display on the pager screen. The optional Ethernet data collection package allows you to remotely check the dialer status with a standard web browser. Using this package you can view real time data, view historical data, automatically send alarm emails to key personnel that specify the exact location and cause of the problem, maintain secure data files, easily create and print graphs over specified time periods for any data and also program temperature limits and power input parameters remotely. a powered input changes state, or the auxillary alarm input becomes active. the alarm and cancels the emergency telephone calls. 참고: Each unit is supplied with complete user’s manual and ac adaptor.